Yes, that´s right! With or without cane, he will be also very attractive and perfect up until old age! Yes, that´s right! With or without cane, he will be also very attractive and prefect up until old age! Rob can sing the way he wants. doesn't matter he will always be on top in vocal talent. Nobody can replace Rob Halford now and in the future! Ripper wrecks the songs of Judas Priest and he is without any charisma, on the video of 2001 live in London, it is an awful video; he dresses like Rob Halford, he wants to sing like Rob Halford (he can´t), he wants to be Rob Halford with all his benefits, but he is not a quarter as good like Rob Halford! 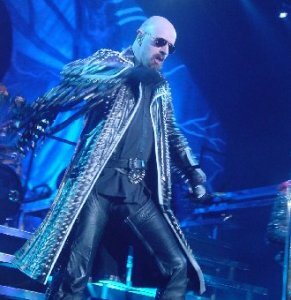 Ripper can sing his own songs, but everyone must keep the hands off the Judas Priest songs, except Rob, these songs belongs only to the one and only Rob Halford, now and forever!!!!!!!!!!!!!!!!!! You're probably right, that's a lot of lyrics to remember though. Halford knows all lyrics from each song,he can everything,He's the best!!! I hear he leans over like that to read the lyrics off monitors, not sure if it's true or not though. yeah that's true, that's right. Agree with Tanya.Ozzy president and Halford Prime Minister. Ozzy is higher than Rob (it's not strange). Ozzy is like dad of heavy metal. So let it be in this way: Ozzy - president, but Rob - minister. Halford is rock soul of heavy metal ( first but not the last)!!!!!!!!!!!!!!!!!!!! Go to loudwire.com and vote for Halford as the President of Heavy Metal!!! Where my account is new I can't post links or post in the main topics. He's losing to Ozzy now. You can vote every hour! Go vote for Halford at loudwire.com !!! He's going to lose to Ozzy!!!!!!!!!!!!!! Yeah I always liked reading "behind the scenes" stuff like that. Interesting read on #1 there, Tasnam. Thanks for posting it. Question: "How much drumming did Dave do on RID?" Answer: "Not a Lot; and let's just leave it at that." #3 Memphis is Live. Period. Halford has been transparent on his solo stuff - "studio magic" to spice up the show. #4 YES on RITE you can see ROb using the teley often. Hmmmm, I'm not buying any of those rumors. BUT, the rumors about Ram It Down on the other hand, I do believe. There is NO WAY Dave did the drumming on some of those tracks. And performing some of those songs live? Yeah, I think he had a little "help" with that too. When asked how much of the drumming he did on RID, Dave responded "Not a lot". At least he was honest about it. What's your take on all this? Why would they need a secret guitar player on the Turbo tour? I didn't notice anything at the show. @pepe2- watch the dvd again and maybe you can see why some people thought that, not a lot of crowd shots , and when there was it was pretty thin , again thats why they are called rumours, no drummer on unleashed in the east, the secret guitar player under the stage for the turbo tour etc. Well that drummer thing is explained in Neil Daniels Judas Priest book. Why they kept Dave in the band if they thought he can't play the new material properly, I don't know. People say Dave never was a good drummer but I think he was, just listen to Screaming for vengeance, could that guy play or not, I think he was a perfect drummer for Judas Priest at the time. Problems really started when it was time to record Ram it down, then again, now most people find the sound of Ram it down oddly processed, too mechanic, too cold, too eighties. Good songs, but yes, they could have done that record a bit differently, with heavier sound and more edge. Actually, that's exactly what they did with Painkiller and fans still love that record. So if Dave had some problems maybe it wasn't entirely his fault.